Let more not be less. While the conversion to full CRUD for entities and classed objects for Drupal 8 made good progress, we’ve not yet reached the goals of fully translatable entities and having a default entity serialization for import/export, content staging and web services. For those points we need to know what’s in an entity! 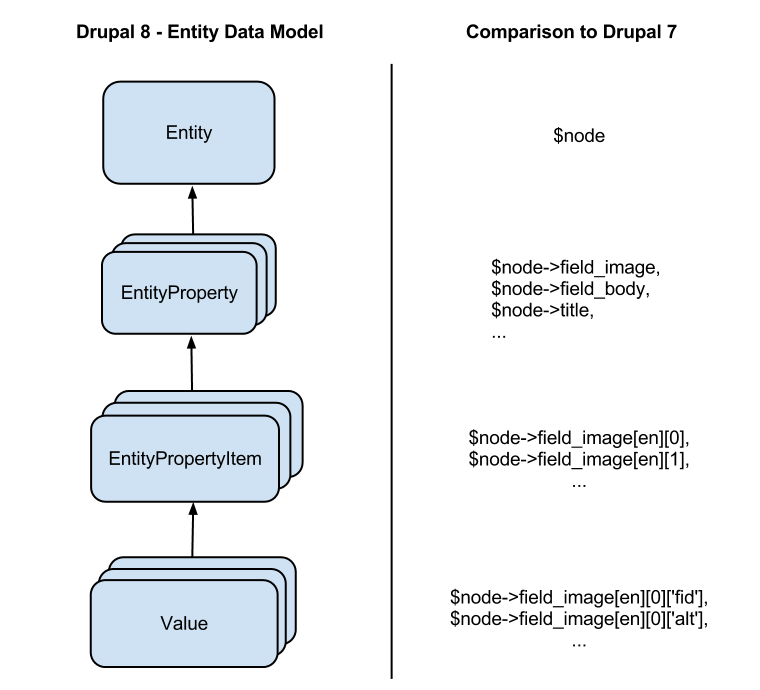 Yes we can look up the fields, but there are also base entity properties and further stuff modules put on entities, which both are no fields so we do not know anything about them. That is what the new Entity Property API is supposed to change: It’s about providing a unified interface to entity properties *and* fields, avoiding the split between fields and non-field properties. So fields will be entity properties working with the same API as well! Then, it’s about being able to instrospect what’s going to be in an entity - regardless whether it has been added by a module or by the user via field UI. But furthermore, with classed entity objects as the basis we can improve the developer facing API and make it easier to access property and field values (I’m looking at you, $entity->field_body[LANGUAGE_NONE][‘value’]). As we’ve outlined in the WSCCI Web Services Format Sprint report we want to have a modern OOP, interface based API for properties. The API should allow for introspection, so that it’s possible to look up the defined properties of an entity type in advance. If you know the Entity property information system of the Drupal 7 Entity module, it’s a bit similar to that, but instead of adding an extra layer above the existing entities it’s about supporting it natively. So there will be no need for entity wrappers - all the easy API and information will be directly available in $entity. See the Entity Property API meta issue for a more complete list of planned features. Work on that is currently done in a sandbox, where we’ll flush out the API with a test entity type. Once this works out, the plan is to convert a first entity type and to post a patch for further review to the core queue (here). Thus, an entity consists of multiple entity properties, which consists of one or more property items (just as field API $items), which each has one or more values (just as field API’s columns). You may notice that no language is in there - the idea is that this all just works with a reasonable language default, while it’s possible to get properties in a certain language by specifying an optional language parameter in the property getter. If the array access is omitted, it will just default to the first property item. That makes it easier to deal with single-valued properties, while it makes sure code does not break if a single-valued field gets changed to be multi-valued later on (or vice versa). That’s roughly where we are so far - of course some things will be adapted and change on the way. There is some prototype code in the sandbox, but nothing is ready yet. If you’d like to get involved, contact me and/or dive into the sandbox’s issue queue. If you are Drupalcon, don’t miss the Entity Property API core conversation and join the entity API sprints! When code is pleasing to read on the eye, it's always a good sign it will be easy to use, remember and teach. That's exactly what echo $node->title->value; is Congrats! Nice work! Thanks for the effort! I love the entity system since I've been using it, and I read the second paragraph of this article with my mouth hanging open. You just eliminated some of the funky nuances of entities that you put up with because they're so powerful. AND, this should make the learning curve of working with entities at the module level much easier as well. LOVE IT. Hope this makes it into D8. Entities are my absolute favorite feature of Drupal 7.